The following conversation outlines the ethical and political potential of new materialisms for science education. The authors explore how new materialisms provide new spaces for the creative ontologies that promote new forms of ethical thinking and action through/for science education. 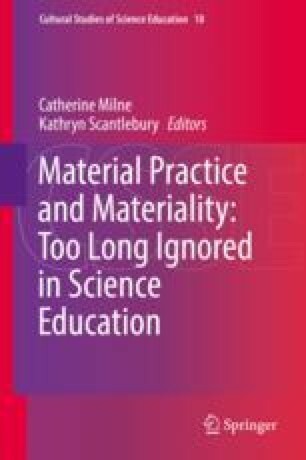 Beginning with a healthy skepticism of the political and ethical possibilities of new materialisms, the authors discuss important concepts relevant to science and science education research such as rhizome, assemblage, territorialization, intra-actions, entities, and multiplicities. In this metalogue, Shakhnoza Kayumova and Jesse Bazzul engage what they say are the most salient aspects of new materialisms. The authors lay out the theoretical grounds for educational communities to begin diagramming assemblages as a way to engage creative ontologies.